I am the luckiest woodworker alive. That may sound a little over the top, but it’s true. Recently a young man interested in starting to learn woodworking stumbled onto my YouTube channel; from there found his way to Highland Woodworking’s site; from there he found and read about a hundred past issues of Wood News Online, and somehow, through all of this, figured out that I live close by. He contacted me via email, and after a few exchanges, we got together. He is setting up shop in his basement, and I have been fortunate to help a little. Wow, what fun! This young man is gainfully employed, super smart, full of energy, good with his hands, and has had some experience with carpentry and other tangential trades from remodeling various areas of his house. When he found me, he had already figured out that a table saw would be a good place to start, and sparing no expense, he bought a SawStop and fitted it with an Incra Positioning System including the extension table router set-up. He had also purchased a top-of-the-line dust collector. The first time we got together we spent most of the time discussing the layout of his shop. Based on our discussion, he produced a deluxe drawing on his computer and emailed it to me. We discussed his blueprint, made a few tweaks, and he got to work arranging and installing everything. He did a magnificent job. His “plumbing” of the ducts for his dust collector was as neat, straight, and well done as any I have ever seen. The wall mounted dust collector looks like photos of it could be used in the instruction manual. A couple of weeks ago he called and we discussed Festool… at length. A couple of days later he placed an order with Highland for a Festool CT-36 and an ETS-EC 150 EQ sander. Later that same week he called saying he had received his Festool stuff, loves it, and now wants to get a Domino machine… which one should he get? The construction of his basement shop continues. He has built a sound-dampening wall around the dust collector and is putting up a partition to separate the “shop area” from the rest of the basement. He’s doing it right. His next project, I think, is to build a Roubo-style workbench. After that he is going to make an outfeed table for the SawStop. Then some cabinets for one wall and a mobile stand for his jointer. Then… well, who knows? So why am I the luckiest woodworker alive? Simple… because every time I see this new woodworker, every text I get, every phone call, I can sense the excitement and energy he has for his new hobby… and I get to enjoy that excitement vicariously. When he buys something, it’s almost like I am getting a new tool, too. When he learns how to use a new tool, it’s like I am learning, too. Now I don’t doubt for even one minute that my “usefulness” to him will wane… and that’s okay. What little bit of advice I can give him now will soon be overshadowed by his own knowledge and experience. He will surpass me in talent and ability and he will build beautiful things. I know he will. I just want to remember the joy of being new to woodworking as seen through his eyes. And I want to find another “newbie” to help… the rewards are amazing. The Highland Woodworker featured on Fine Woodworking’s Shop Talk Live! 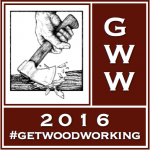 Get Woodworking Week – The Goal Is More Woodworkers, Right?